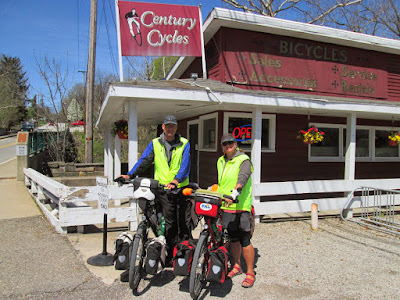 Century Cycles Blog: 2014 Bicycle Touring Season unofficially begins! The bicycle touring season is upon us, and these two visitors in Peninsula have kicked it off in a big way! Eric and Astrid are from the Netherlands. They started their around-the-world bicycle trip in April of 2013, and spent eight months pedaling around Europe. After tour of a few Central American countries, they flew to Miami, and headed north from there. They've been traveling the Underground Railroad Bicycle Route, which they'll follow to Toronto, then head across Canada to Vancouver, then head south to Los Angeles, then catch a place to either Australia or Asia. You can see more photos of touring cyclists who have visited all three of our stores at the Century Cycles Bicycle Touring Photo Gallery.